To my fellow Twitter-holic soccer fans out there, the hashtag is quite possibly one of the most important aspects of your day-to-day life. Which is a little sad when you think about it, but I’m going to give myself a pass if for no other reason than to feel better about myself. Regardless, the use of the hashtag is a perfect way to not only get your tweets seen by a larger audience, but also keep tabs on the general thoughts and opinions of those talking about a similar subject matter. Problem is, finding out what hashtag is going to give you the best reach and or broadest range of responses can be a difficult task. 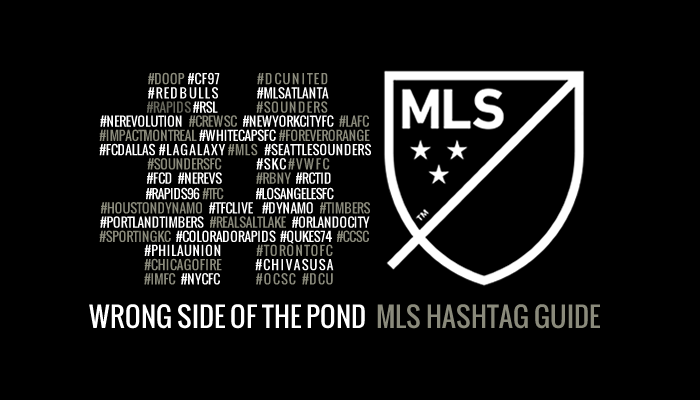 So back in March of last year, I attempted to gather all of the “official” Major League Soccer hashtags for each team into one singular location. Anyway, back when the Columbus Crew rebranded to Columbus Crew SC, a debate sprung about within the Crew fanbase as to what the “official” hashtag would be for use on Twitter moving forward. Would the legacy, club-endorsed #Crew96 be sticking around, or would it be replaced by #CrewSC, #CCSC or something else entirely? Though lines were being drawn in the sand between supporters, nobody was exactly sure the answer to that question. So when Crew SC owner Anthony Precourt attempted to set the record straight by deeming #CrewSC as the new officially club endorsed hashtag, the reaction from the support was predictably chaotic. But it did make me think. You know: the list that I made a year and a half ago is probably way out of date. And it was. New teams have come into the league, new designations have been developed, and poor Chivas USA has gone the way of the dodo. And that means things are horrendously out of date. So I’m redoing it. Today. You can you find it past the jump, just in time for the upcoming 2015 season. Let me know if I got any wrong, am missing one that I should be using, or any other suggestions by dropping an email to contact[at]wrongsideofthepond[dot]com or hit up the comments below. Agree. Just want to include that for secondary, it’s common to use #DTID round these here parts.